Let me start by saying that I am not an expert on search engine optimization (SEO.) I’m just a person who pushed the “publish” button a couple of years ago, who happened to do a bit of research and who, along the way, has learned a few things about what search engines like to see on our blogs. There are so many posts about blogging out there: how to start; why to start; how to market; how to photograph, etc. And there are many blog posts specifically about food blogging. But SEO for food blogging involves some specifics and detailed information and unless you have sat through a few conferences, you might have missed it and food blog-specific SEO posts are not widely found. Kansas City has a local community of bloggers who meet monthly and a few months ago I (along with a local photographer and family blogger) led a discussion on search engine optimization. The group is diverse and there were many questions about food blog SEO…which led me to the decision to do a quick three-week series on the topic. This group is so amazing and it helps remind me constantly to share the knowledge that I have on various subjects. 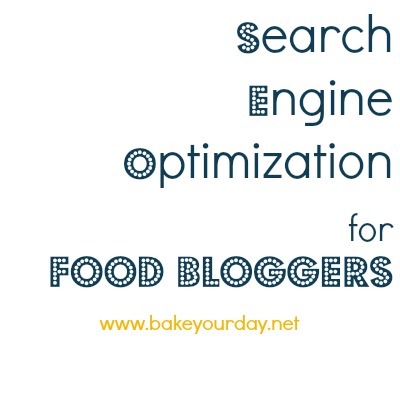 So here you are, SEO for Food Blogs 101. And again, I am not an expert. What I will tell you here is basic and I hope it will provide you a foundation for beginning solid SEO practices on your blog. I’m still learning. In fact, I love learning. The geek in me loves this stuff. So ask away. Make a list, send it to me in an email, post it on my Facebook page. If I can’t answer you, I’ll do the research and ask around so that we can figure it out together. Let’s use this as an opportunity to build community. First things first: let’s define Search Engine Optimization. Wikipedia explains that SEO is the process of affecting the visibility of a website in a search engine’s natural or organic search results. In other words, search engine optimization involves practices that you employ on your website which help search engines recognize what kind of content you have on your site. SEO is writing and formatting your content in a way for search engines to be able to read and index blog content. Why do you need to optimize your site for search engines? SEO strategies not only build credibility with search engines but also for people who are searching the web. How many times to you make it to page 10 of your Google results? How many times do you click the first few results that pop up? See what I mean? Search Engine Optimization is a long-term strategy. It’s not a “set it and forget it” type of thing. It builds on itself over time through consist and quality content. It’s not overly time consuming but will require you a few minutes per post to make sure everything is titled, tagged, and key-worded correctly. If you are WordPress.org, this will be even simpler because there are plugins that do a lot of the work for you – we’ll get to that in a couple of weeks. The posts for the above-named topics are subject to change because they are not yet written…and because I want your questions! What do you want to know? I have an idea of where they will go but I would love to know where you stand on these topics. What do you currently know, what do you feel like is most important, etc. You can email me or leave your suggestion/question in the comment below. Also, if this goes over well, I will plan to continue posts like these from time-to-time so if you have any questions about blogging or food blogging in general, leave them in the comments below and I’ll add them to my list! Awesome post, Cassie! Can’t wait to read the next few!! Can’t wait to see where this goes! I do SEO tags and description with the plug in, but who knows if I am doing enough! The links and recipe formatting one is interesting to me, because I didn’t know any of that matter – so I am curious what you learned! So great to have a local group to get together with – I wish I had that! Recipe format will definitely be in there! SEO gives me gas, so I totes need this. I love you girl! I would love help here as I have been meaning to look more into this topic..it’s on the never ending “to do” list. I will think of some questions and email you. I am so jealous of that blogging group y’all have- it sounds amazing. Thanks for sharing your knowledge Cassie! So glad you are doing this!! I’m hoping that maybe you could shed some light on how to get a picture to show up on the Google search? I’m not sure if that fall under this topic but I’m oh-so curious about that! I had not thought about that, thanks for the suggestion! yay!! I want to read them all right now haha. I need a ton of help in this area for sure. And I agree with Laurie above – how in the world do you get a picture to show up in google search? This is the biggest question I’ve gotten so far. Will definitely do my best! You are awesome for doing this, thank you so much for sharing!! There’s so much to learn out there. Yay! I’m excited to learn more! I am the opposite of Laurie – I feel like most of my Google hits are from Google Image, so I need to learn how to get my content/verbage more SEO friendly. This is going to be amazing, Cassie! Great idea for a post series! I’m looking forward to all the great information to come. I just came across your blog and I’m excited that I’ll be learning more about this. Thank you for sharing this information. So glad to have you here! This is perfect, Cassie! Cannot wait to keep up with it. I am super pumped for this! I just recently switched to self-hosted wordpress and am fumbling my way through this stuff. I’ve been putting in alternate titles, meta descriptions, tags, etc, but have no idea if I’m doing it right! I’m curious about whether you could shed some light on SEO for pictures. Does it matter how you name pictures? Do you need to include alternate text for pictures? What about captions? Thanks for taking this on and sharing with us all! Yep, I will cover all of that. Thanks, Courtney! I am so looking forward to this! Thank you for posting and sharing! Thank you for writing this, Cassie! I am looking forward to the subsequent posts. I need so much help in this area. I have also been debating on whether I should move my blog to WordPress since it has so much more functionality than the CMS I currently use (developed by an independent small biz back in my hometown). There are so many features that WP has that are missing in my current CMS and my blog lacks a lot of practical and functional features, and I think this detrimental for my blog in the long-run. But the thought of finding another blog management company and moving all of my content to WP makes me almost break out in hives! I really need to think carefully about this. I’m looking forward to reading your piece on WP to help me with my decision. I will do my best! I mostly know WP but I’m going to do a little research on the other platforms. If you have any insight, let me know! Thanks for doing this Cassie. I am pretty much illiterate when it comes to this stuff. I can’t wait to for your future articles. Somewhat. I will cover some of the things the best I can but will provide some resources! SEO is something we are all trying to keep up with, can’t wait to see your posts! I’m excited for this series! I have a small question for you: How do I get my photos to show up in google image results? That’s been the #1 question. I’m going to do my best to answer it! Obviously whatever you’re doing is working b/c when I google for a particular recipe, your site is often one of the top 5 that come up. Can’t wait to read these posts! I am really excited about this!!! I am thinking of switching over to WordPress down the road (wish I could afford to do it now) so I am super keen to hear about all the plugins and stuff with that. I am not so good with SEO, so I cant wait! If I think of other questions Ill be sure to ask 🙂 Great series Cassie! Great idea for a series- I am just getting started out and really appreciate the advice/intel I can get. Can’t wait for next Thurs! Another total newbie here that is very much looking forward to this series! Great series! I’m really looking forward to the next posts! I don’t know much about seo so this is incredibly helpful. If possible, I’d love to know more about how google+ helps with seo. I’m not even sure if it does but people tell me it can be so helpful. Good one! I’m still learning G+ but I’ll do my best! I am looking so forward to these posts Cassie! I don’t know much about SEO but would love to learn and your posts sound perfect for getting started! I will be here waiting anxiously next Thursday! Thank you! Only for self-hosted WordPress.org though. Thanks! I’m going to cover this part in a few weeks. So glad you are here, Jess! I am sooooo glad that you are doing a post on SEO! I don’t have it on my blog and need it so badly but I consider myself not to be Tech savy when it comes to behind the scenes stuff with my blog. I am trying but I too have so much to learn. So glad you are doing this series, I am so clueless when it comes to SEO. Everytime I sit down to try to figure it out it gives me a headache! Absolutely love that you are doing this series, Cassie! I have so much to learn! Cassie, thanks SO much for doing this! I need all the help I can get. This stuff makes my head hurt. I’m so glad you can explain it to me in normal person language. Really looking forward to this series, Cassie! I have tried to read about it, but it just gives me a headache and there is so much information! THANK YOU for doing this post. I need all the info I can get from people who actually know a thing or two. Can’t wait for the next posts…. I am soaking it all up! This is going to be a great series! I think everyone hates SEO… so I’m thankful your tackling the topic head-on! Great idea! I am very much looking forward to this. I would love to hear some tips for foog blogs in Blogger. I started my blog about 8 months ago on Blogger and in hindsight should have used WordPress, but hard to transition now! Thanks for commenting, Jessica! I started on Blogger and moved to WP.org about 8 months later. It wasn’t so bad but I did have some help. If you’d like recommendations, let me know. In the long-term, WP will be much better for your blog’s SEO but there are some things to do on Blogger that will help and I will cover those! Cassie – If you’re open to guest thoughts within your series, I’d love the chance to address the rich snippets question for your readers (a.k.a the image showing up in Google searches) and pass along some tips, plugins, etc! I’m one of the owners and developers of the GetMeCooking recipe plugin for WordPress (http://www.getmecooking.com/wordpress-recipe-plugin). Our plugin is very focused on SEO (and I have written about it and given presentations on it), so please feel free to contact me if you have any questions for the plugins chapter of your series. Cassie – one of the coolest things about you is that you’re so generous with your food blogging knowledge. It’s so amazing to hear about some of your tips for success. Based on all the comments, I can see that I’m not the only blogger who agrees. Thanks for putting this information (and your trial-by-fire findings and research) out there to share! You rock. You just made my WEEK, Marisa! Thanks so much for your comment, it’s truly my pleasure to pay it forward!! YOU rock. Oh Cassie, Cassie, Cassie. I just read all 4 posts. I’m doing so many things wrong. ACK! But I consider you a lifesaver and my new best friend for sharing all this information. Thank you! Thank you so so much. I am so grateful to see this info you have written about Seo’s. I have been blogging since October 2014 and I blog regularly but I feel I have so much to learn about getting found. For some reason unknown to me I have attracted the whole podiatry community to my blog. It’s great because they give me good response but, I want to attract more people who love what I love. Thank you again. I will be studying this info and checking back. Thank you so much for posting such an organized overview about SEO. I’ve just launched a food blog and am eager to share my recipes. To do this, I have to be easily searchable. Looking forward to the next session! Just wanted to say thanks for this series. I have just read through a little bit of the first two in the series and have understood so much more of what I need to do. Thank you!